I will continue with the journal type format, that I have used in the past, incorporating the assignments work along the way. Since I already have a business in Second Life I am listed in the search bar using keywords such as counseling, coaching, and mental health. People can come and visit my office most days of the week by using the search bar and teleporting there. It was in this manner that I met Loki Koba, a vocational rehabilitation counselor. He had teleported to my office, gathered that I was in-world and sent me an instant message requesting a meeting. I was involved in a group meeting, at the time, and so set an appointment with him for the following day at 2 PM. 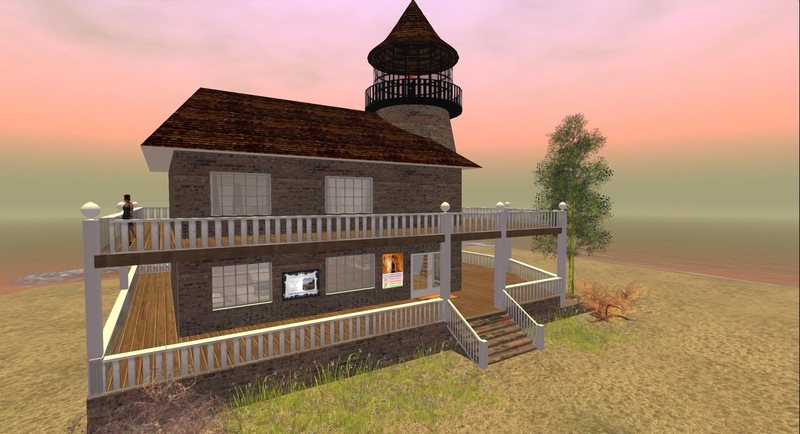 We met at my office (pictured below) the next day and he asked me a series of questions concerning how to set up the business and become involved in helping people within the Second Life world. I told him of the joys and pitfalls, gave him some professional guidance, introduced him to a few Second Life groups, for people in this field, that he could join and friended him for further conversation. He may or may not end up working with people in Second Life but I had made a new professional associate and it is yet another network connection that may be mutually beneficial in the future. Previously, I had arranged to meet with one of my group members this afternoon. Unfortunately, my team members were not able to make the meeting. 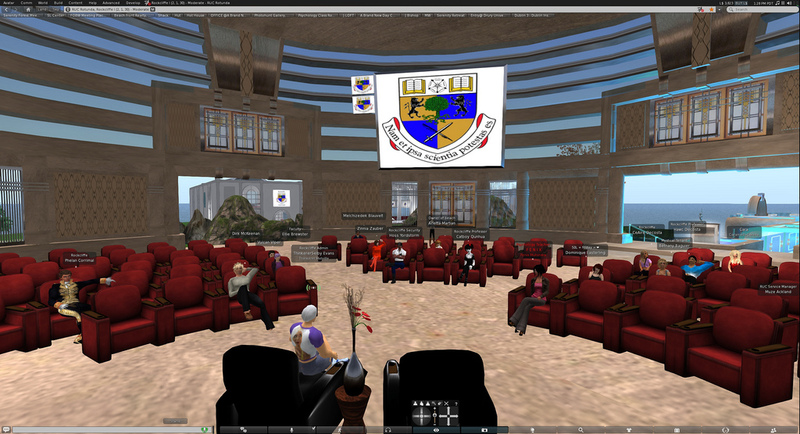 Instead, I spent time in Second Life at a lecture at Rockcliffe University given by Thinker Melville about social media programs. Since an avatars profile can be accessed by a mere click, going to such lectures is a good way to meet new people. Apparently, this is what one of the gentleman, seated behind me, in the lecture hall (pictured below) had done. I left that lecture with a new educator friend, as he instant messaged me asking to be added as a friend while we were listening to the lecture. 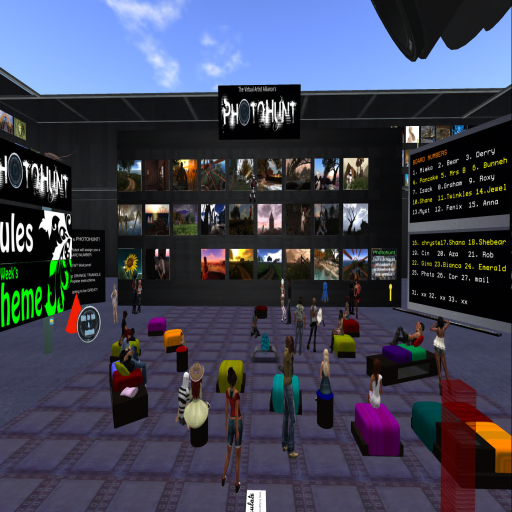 We chatted briefly regarding our universities, courses and teaching in SL as opposed to RL. This is a simpler and less intrusive manner of networking then going to real life conferences. A group that I belong to had their annual Halloween Party. They allowed me to take pictures but requested their anonymity. 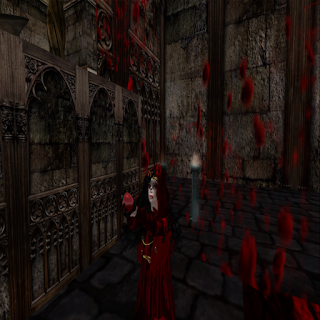 One of the members is a talented woman that works for a University in Tennessee , which has a presence in SL. She has a wonderful southern drawl and was the DJ for the party. We had a costume contest, played a Halloween focused trivia game and chatted all while dancing our avatar butts off! I spent Monday working with clients in SL as usual. However, I felt that because I need not get to meet with my Dream Team group I needed to do some work regarding communication through social media. I chose to set up a Facebook page in the name of my Avatar. I had already set up a SL group entitled Dream Team 2 and Kautostar had joined. I began attempting to Tweet with Kauto and Autocat using #DT2 in the manner that we all Tweet with the class as a whole using #iole2. I do not know what my group members will prefer for the project. 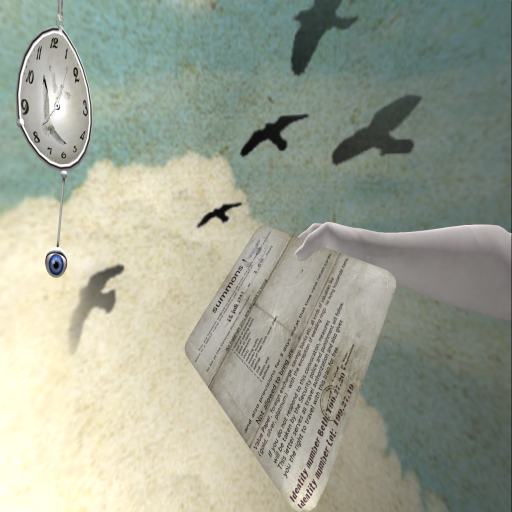 I received an email via the Second Life education list-serve regarding a mini-exhibition that was about to end. "Home" was created by Higher Enoch, Isis Sherryffe, RosaVioletta and Sheila Yoshikawa. 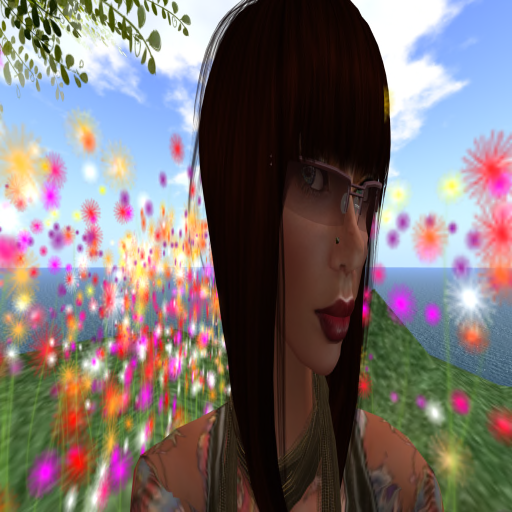 While exploring the interactive display I met Carol Rainbow, one of the owners of EduNation in SL. She teaches conversational English to air traffic controllers so that they can more accurately communicate in emergencies. It seems that their english regarding work-related topics is perfect but when a crisis happens mistakes in communication are made that have lead to fatalities. She relates that they use SL to set up scenarios or "events" to practice actual crisis that are likely to occur in flight. One such event was about a passenger having a heart attack and the staff needing to coordinate first aid in the air and emergency services when they land. She went on to say that the week following the exercise such an event actually occurred in real life and a life was saved! 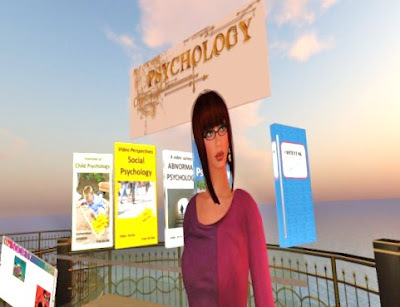 Meeting her was pure happenstance but being willing to say hello netted a wonderful story and a new associate to add to my educators network in SL. 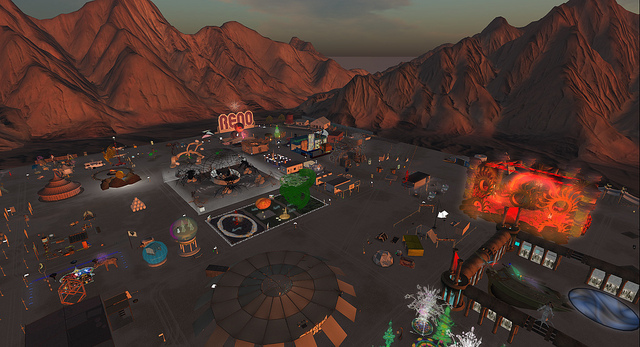 We traded landmarks and general information regarding our work in and out of SL. It was really quite a pleasant conversation. Arkhamville - this pic took 2nd prize! A Halloween Photohunt contest! I love my weekly photo group of people. We truly have a good time! we went to Arkhamville and did our very best to photograph the sim. SuzieQX2 Oh of the Arkhamville Builders Group was there to meet and greet us. She was very helpful to our Photohunt members. 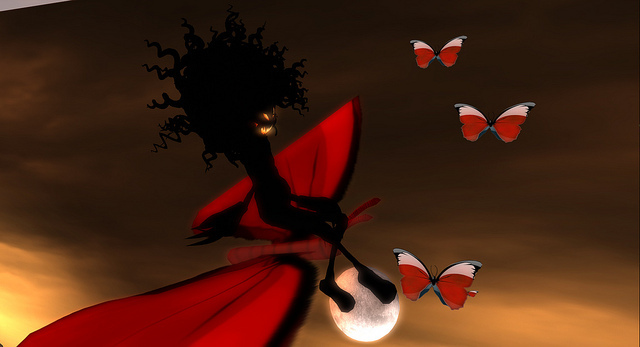 We had a brief conversation regarding my silly Halloween avatar :) and them she was on her way to mingle with the others. Arkhamville-Once up on a time in a land not so far away, there was a village where many dark and mysterious things happened and someone was murdered. 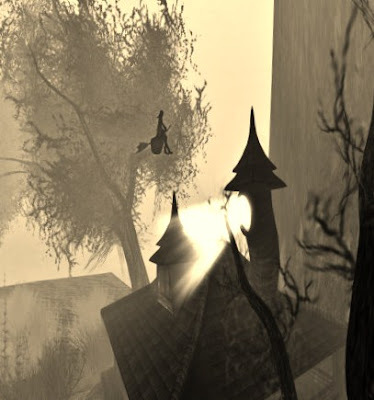 Come solve the mystery of Arkhamville-talk to villagers, hunt for clues, explore the area. Yet, another week has come to an end. Blogging remains very difficult due to my inablilty to use my right arm. I have tried dictating, typing with my left-hand only as well as dictating on a mobile device then emailing, cutting and pasting into the blog. Nothing is working very well but I am, for the most part enjoying myself. This is a belated post. I have had an extreme amount of difficulty typing since my shoulder surgery three weeks ago. My work seems to be piling up on me. I have trained my voice to text program and soon hope that it enables me to catch up on the blogs for this class as well as other work that I must do for my students. So, here goes. 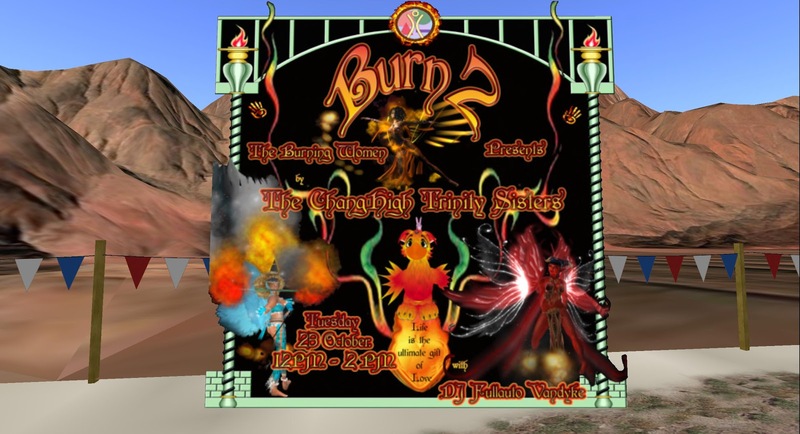 I will share with you what my exploits have been in Second Life this past class week Friday thru Thursday. 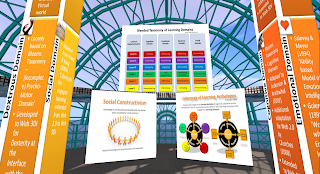 Along with being a student in Second Life I am also an educator. 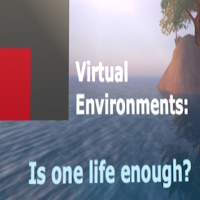 starting this course last week reminded me of my time being instructed on how to teach courses in Second Life. 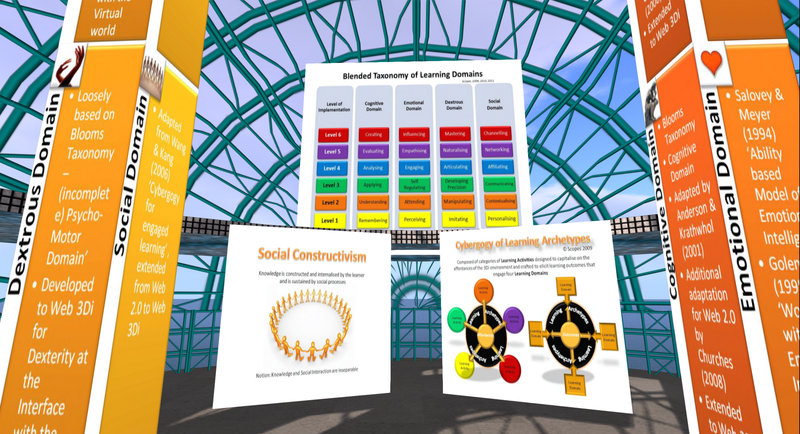 So, I revisited my teacher/friend's display at the ARCHI 21 of her Cybergogy model, which she taught me in a six week course for Drury University.not only is this model effective for creating lesson plans to teach within Second Life but the virtual rendition pictured below passes out notecards for educational purposes by clicking on it. It is the experience of Leslie Scopes a.k.a. Light Sequent that prompted me to take this module as she had difficulties maintaining ownership of her intellectual property within Second Life and the Internet. 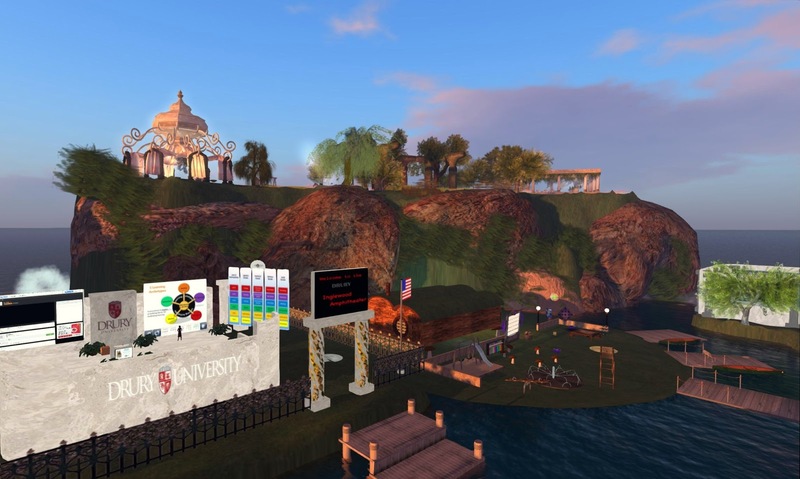 I also visited the Online Education Sim that is Drury University, as we are preparing to welcome new students for the next eight weeks. 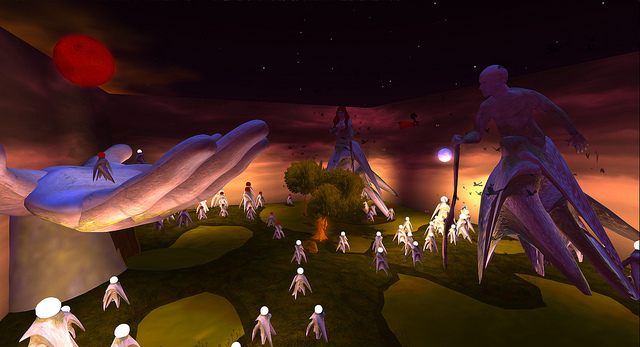 I spent a majority of my time in Second Life on the weekend going to a celebration of art. There was so much to see! the interactive creativity exposed to the world through this medium was inspiring. It was impossible for me to view it all due to my time constraints. Monday's in Second Life are spent counseling my clients. There will be no pictures of that process but I spend six hours every Monday evening helping people, in the form of avatars, manage their mental and emotional issues. Tuesday's time in Second Life was spent hunting down Halloween costumes. 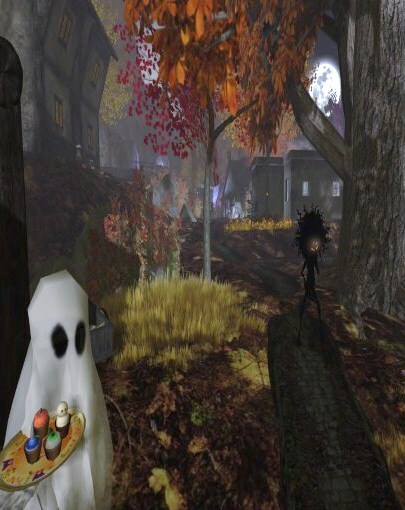 Halloween is a special time in Second Life and there are many themed sims to visit for this time of year. Here's a picture of me in one of my new costumes at Burn2 flying on a butterfly over the moon. I will include more pictures of hollowing costumes in next week's blog. 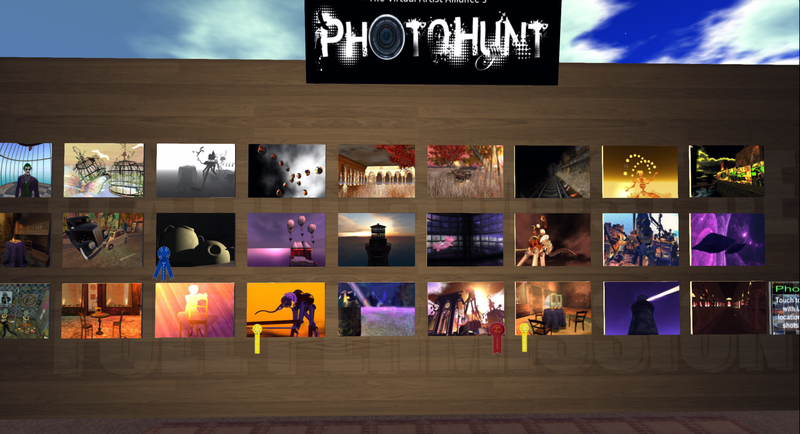 Every Wednesday evening I go to the PhotoHunt. this week we went to a lost world in Land of Glory. there were 27 hunters and the picture shows ribbons on the winners for this episode. I particularly like taking pictures within Second Life because you have the opportunity to change the colors of the world that you see by using something called when my in the simple drop-down menu. Here you see an example of my use of when my to produce a completely different feeling of the same scene. I created an SL group "Dream Team 2" to facilitate communication between group members for the module project as well as passed an SL note card with my contact information to the class. This was in hopes that it would make the collaboration of ideas a little simpler considering I live in the USA and my team mates as well as classmates live in Ireland sans one other American. The class focused on personal branding. I gave an "Elevator Pitch" to promote Fenix within the class as sort of an introduction and listened intently to others give theirs. Also, throughout this week I have created profiles or pages on most social media websites for Fenix Muhindra to meet the requirements of this course. So, another blog is written for better or for worse. I have learned quite a bit about the construction and publishing of a blog along with enjoying different aspects of my class and classmates. A new class, really? You don't have enough on your plate? 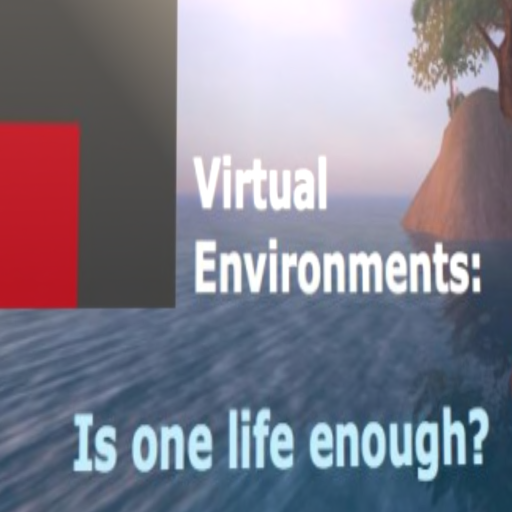 It's in Second Life? Fenix! you just cant seem to stay out of that place! And NOW you think you have to go to a class at the Dublin Institute of Technology in your beloved Second Life of all places! 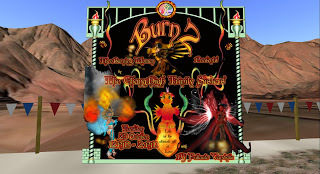 On 10/11/12 Fenix got her wish and joined her instructor 'Accupa Tae', guest speakers and classmates in Second Life(SL) at the Dublin Institute of Technology (DIT). We were tasked, among other things, to visit three places in SL and then describe them in a blog which should be then tweeted. First, I went to a familiar place to gather ideas about where I would like to visit. The picture shows the Photo Gallery for the Virtual Artists Alliance competitive group called "Photohunt" owned and operated for several years by Dave Koi. Here there are hundreds, maybe thousands(all told) of snapshots taken in Second Life of various simulations(virtual land) with information on how to teleport(tp) to the land. A classmate, Dudley Dreamscape, was online and I tp'd him to my location to share the bounty. He encouraged me to blog about this area. The landmark is embedded in the caption of the photo for all to visit. I compete with other avid photographers each week for bragging rights and Linden Dollars, the Second Life currency, which is able to be converted to actual cash in my real life bank. Blood City (starbucks inc.) and the Dark Forest. Next on my journey was a Vampires Haven where I participated in the Blood Dolls ceremony.I met up with one of the owners, Mieka. I had met her quite some time ago in the Photohunt. She calls herself a "Reluctant Vampire" but the place that she and her friend has created is a tastefully done dark and foreboding place with intricate structures like the church where I am rained in blood as well as wonderful forest landscapes. Since I love photography and the surprises that are in-store around every corner of a new sim. I had to visit 'Addicted!' after seeing the photos displayed of it at the photo gallery, just for the sheer beauty. There are so many items that it is difficult to know where to look next. This Dali-esque vignette caught my eye for a snapshot. 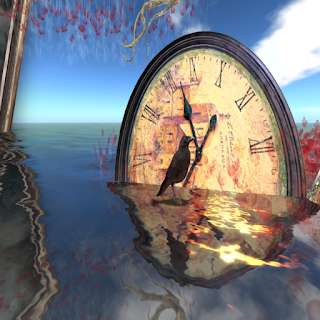 The words, surreal, fantasy and pretty come to mind while strolling around this watery sim. Another surreal sim "A Rusted Development" to be true it is one of my favorites. I have been here many times. I have taken maybe 30 pictures at different times here because there is so much in the way of unusual beauty. I learned about the artist Haveit Neox at Second Life's 9 year birthday party. I visited his other creations and had a long and friendly Instant Message (IM) conversation with him during that time. Finally, this evening I traveled with a friend to an old sim 'The Wastelands' where he honed his skills of SL craftsmanship and scripting. While sitting together he described the fun that he and his friends had perfecting weapons, vehicles and other assorted objects. Hanging on the walls were interesting abstract drawings. This is a self portrait by neon hammerer. Tomorrow is my REZ (birthday)day! I will be four years old. I am still amazed at the beauty and wonder that is SL and it's residents! There are friends here that I would never have met. Places here that I could never have imagined. Opportunities that were never on my horizon before! I have learned this week the setting up of a Twitter account, the minimum of manipulating and writing a blog, and the briefest information regarding a couple of classmates. 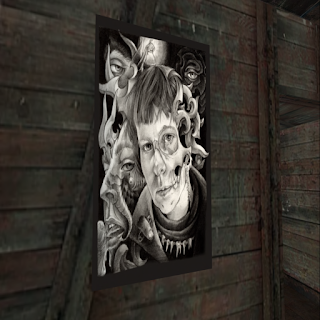 I have also learned that much is taken for granted with the intellectual properties of creators in SL. I hope that I did alright in the crediting of the artists within this blog but I realize that it was a minimal and sloppy attempt. I look forward to what this module"Is One Life Enough" will teach me regarding the best way to accomplish such things.